Popular Johnson & Johnson's baby shampoo, reported to contain chemicals that can cause cancer, remained on the shelves in Chinese stores yesterday. The shampoo was found to have both formaldehyde and 1,4-dioxane during a test at an independent laboratory in the United States, commissioned by the non-profit Campaign for Safe Cosmetics. The organization tested 48 popular baby bath products, such as bubble bath and shampoo, for 1,4-dioxane and 28 of them for formaldehyde. Of those, 32 were found to contain traces of 1,4-dioxane, 23 contained small amounts of formaldehyde, while 17 tested positive for both chemicals. 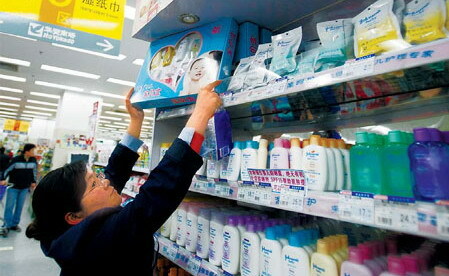 Of all the baby products, only Johnson and Johnson's baby shampoo is available in China. The General Administration of Quality Supervision, Inspection and Quarantine, China's quality watchdog, has not yet commented on the matter. Formaldehyde is created when preservatives break down over time and 1,4-dioxane is a byproduct of chemical processing techniques. Formaldehyde and 1,4-dioxane are known to cause cancer in animals and are listed as probable human carcinogens by the US Environmental Protection Agency. Formaldehyde can also trigger skin rashes in some children, Campaign for Safe Cosmetics said in a statement last week. The US Consumer Product Safety Commission said: "The presence of 1,4-dioxane, even as a trace contaminant, is cause for concern." There are no regulatory standards limiting formaldehyde or 1,4-dioxane in personal care products sold in the US. Formaldehyde, however, is banned from those products in Japan and Sweden, and 1,4-dioxane is banned from products in the European Union, said Campaign for Safe Cosmetics. Responding to the test results, Johnson & Johnson said in a statement: "The trace levels of certain compounds found by the Campaign for Safe Cosmetics can result from processes that make our products gentle for babies and safe from bacteria growth. "The FDA (US Food and Drug Administration) and other government agencies around the world consider these trace levels safe, and all our products meet or exceed the regulatory requirements in every country where they are sold. "We are disappointed that the Campaign for Safe Cosmetics has inaccurately characterized the safety of our products, misrepresented the overwhelming consensus of scientists and government agencies that review the safety of ingredients, and unnecessarily alarmed parents." He Qiaomei, a mother of a 5-year-old in Guangzhou, Guangdong province, said she will not buy the company's baby shampoo any more. "The manufacturer should be brought to justice," she said. Local supermarkets said they will keep a close watch on the developments and take the product off the shelves when they get a notice from quality supervision authorities. In Shanghai, where Johnson & Johnson (China) is based, quality supervision authorities are paying close attention to the products in question and will soon come out with a statement, the Shanghai-based Youth Daily reported.